What if I was to tell you that the bacteria and the environment in which they live is responsible for more than just how your stomach feels? What if I was to tell you that, depending on the number, variety, and vitality of your gut microbiota, it can determine or be the missing piece of evidene as to why people have autoimmune disease, diabetes, cardiovascular disease, pain syndromes and dementia? Many of the patients I see complain of some sort of gastrointestinal dysfunction. In fact, many patients with major complaints of depression express some level of bowel alterations. The level of depression seems to be dependent on the severity of bowel dysfunction. In other words, the worse the patient’s GI symptoms the more depressed they can feel. This is not a simple coincidence. 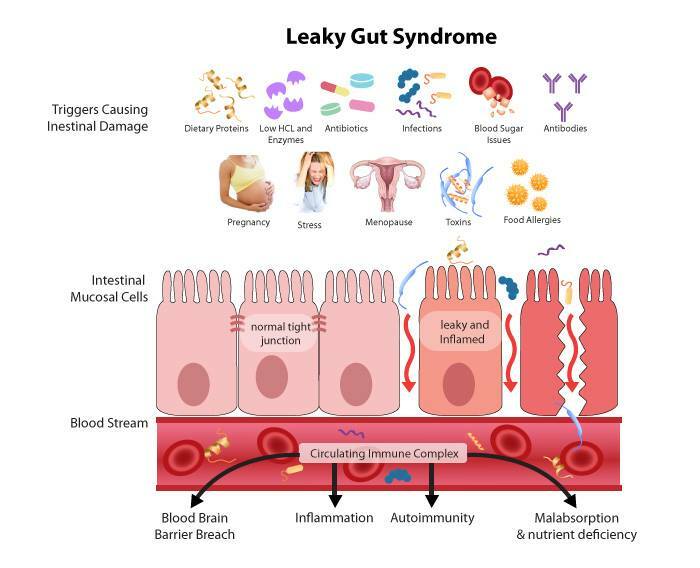 If you do not move your bowels at least once per day, or you have fluctuations, that is, constipation or diarrhea, you probably have GI dysfunction also called Leaky Gut Syndrome. If you have gas and bloating or get sleepy following a meal, you probably have GI dysfunction. Yes, these are all local GI symptoms; but how does this relate to the rest of our body including the brain? The bacteria that live in and on us are involved in up to 90% of our biochemistry and physiology. The gut has a diversity of over 1,000 species alone. 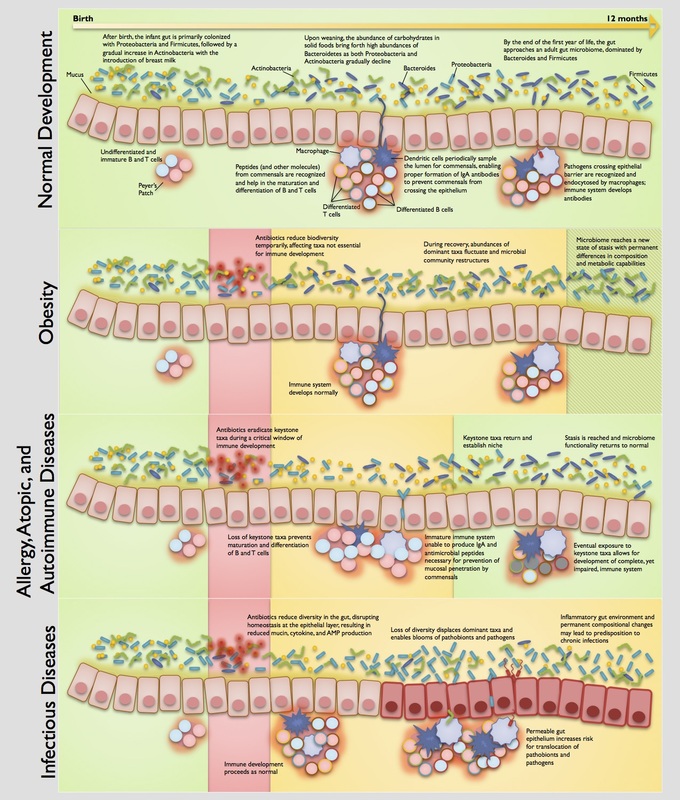 You can start to see why we stress gut health so much. These bacteria, in particular the gut microbes, are responsible for energy extraction from food we eat—they take the macronutrients we consume and separate them into vitamins, minerals and other chemicals that our bodies need to function properly. 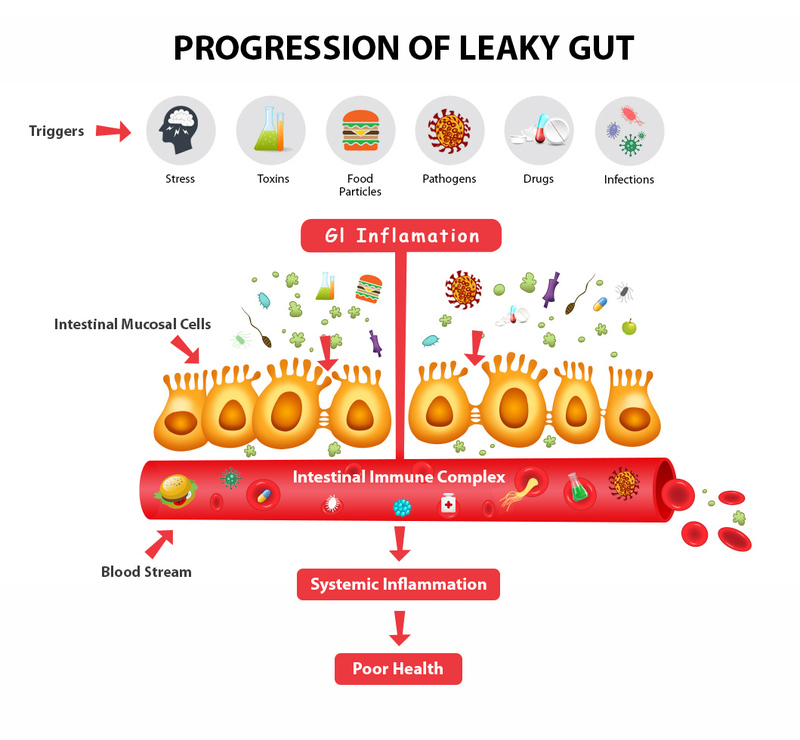 This is the obvious function of gastro-intestinal bacteria; but did you know they are imperative to proper hormone balance, brain function, cardiovascular protection, and detoxification of harmful substances? 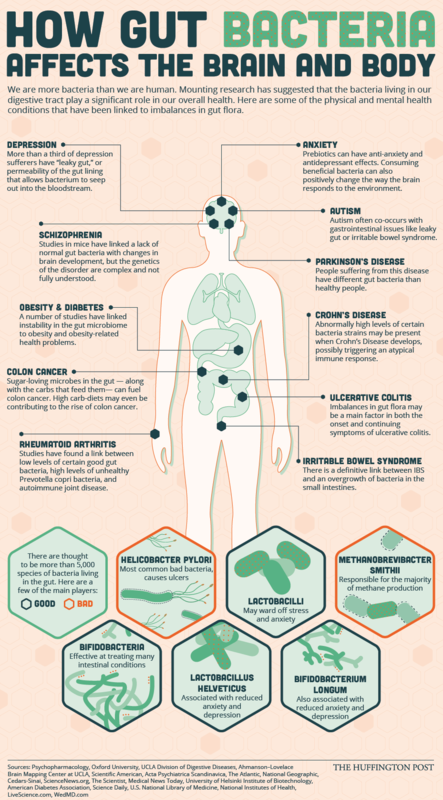 How can bacteria in a person’s GI tract affect parts of or their entire body including the brain? The answer is pretty simple but has been clouded by the over-specialization of medicine. Each system of the body has a medical specialist- cardiovascular doctor, rheumatologist, etc. This partitioning of the body makes one think that each organ or system is separate and do not have an interaction or reliance on any other organ or system to thrive. This is the furthest thing from the truth. The body has a web like interaction between cells, tissues, organs, and systems. There are many mechanisms to account for this, but we will breakdown the basic ones. 1. Parasites, yeast and bacteria utilize sugars for energy. The sugars are fermented, much like in the production of alcohol, and create a compound know as acetaldehyde and CO2 (carbon dioxide). This fermenting is what can create the gas and bloating, as well a possible allergic reaction to acetaldehyde, which can lead to a gamut of symptoms and pathology. Acetaldehyde is similar to a compound that is created when you have that “hung over” feeling. Imagine having these chemicals produced 24/7! 2. Some bacteria can produce a compound called lipopolysaccharides, aka LPS. LPS can up-regulate the TDO (tryptophan deoxygenase) enzyme which takes tryptophan and converts it to kynurienine. Why do we care? We care because this tryptophan is shunted from its normal end product, serotonin, which plays a major role in satiety, mood and sleep/wake cycles. This can lead to sleep disturbances, mental fogginess, and fatigue. This same shunting of tryptophan happens when we are exposed to pesticides such as glyphosphates (“Roundup”). GMOs are to be avoided as they usually contain higher than normal pesticide exposure. LPS can also cause immune activation in the brain and the degeneration of the fatty tissue (myelin) around our nerves that insulates them and allows proper nerve transmission. An imbalanced gut will eventually lead to the breakdown of the lining and damage of certain cells in our intestines. These cells, called enterocytes, play many roles, but one major role is in the phenomenon known as “first pass metabolism.” First pass metabolism is of the detoxification process of toxins. It prepares toxins to be easily metabolized by the liver and excreted through the feces or urine. If these toxins are allowed to accumulate, they can cause liver damage as well as enter the brain and nervous system to cause alterations in chemical signaling that could disturb movement patterns, speech, and thought processes. I feel that the gastrointestinal tract has long been overlooked as a possible source of more serious conditions. In my opinion, a thorough history of antibiotic use, toxic exposure, lifestyle and, if merited, a functional stool analysis should be performed on every patient. The connection between the gut microbome and many conditions that are prevalent in America today is obvious and well documented in research. We, meaning the Medical community as a whole, need to take a closer look at this connection in relation to our patient's health and vitality.